Suicide attacks have become a modality of terrorism of increasing application among extremist groups. During the last three decades this phenomenon has emerged in many countries around the world, including Lebanon, Israel, Sri Lanka, Iraq, United States, Spain, United Kingdom, Afghanistan, Pakistan, India, Algeria, Morocco, Turkey, Chechnya, Uzbekistan, etc. Based on a previous and general understanding about terrorism (see De la Corte, et al, 2007), this paper outlines a psychosocial explanation of suicide terrorist attacks. This includes a psychosocial characterization of the phenomenon and the answers to three main questions. First, why terrorist organizations move their tactics to a martyrdom strategy? Second, why individuals may radicalize their attitudes at the point to become a suicide bomber. Finally, who could support suicide tactics and why? According to several authors, social psychology is the scientific study of the way in which people’s thoughts, feelings, and behaviours are influenced by other people (Aronson, 1999). The phenomenon of social influence is at the very heart of social psychology. Sometimes this influence happens in a non-deliberated or non-direct way. But other times individual and groups deliberately try to change another person’s behaviour. There are a variety of tactics that people apply to influence other people. Terrorism involves the use of force or violence in order to instil fear as a means of coercing individuals or groups to change their political or social positions which means that social influence is the ultimate goal of terrorism. Obviously we could say the same about suicide terrorism. The syndrome view is implicit in many treatments of terrorism (see Kruglansky and Fishman, 2009). From this perspective, suicide attacks are like a syndrome which prompts the search for some definite causes: internal (e.g., personality traits) and/or external causes (e.g., poverty, political oppression). In other words, suicide terrorism can be seen as a direct effect of some social or psychological disorder. The empirical research, however, did not reveal any distinctive psychological disturbance in suicide attackers and their leaders. Profiles of both are not informative enough to give a serious explanation of their behaviour. Finally, there are also serious doubts about the impact of social or situational so called ‘‘root causes’’ on suicide terrorism. Therefore, suicide terrorism is unlikely to emerge as an inevitable consequence of some root cause, such as poverty or political oppression (Krueger and Maleckova, 2002). An alternative perspective views terrorism, including suicide terrorism, as tool: a means to an end and a tactic of warfare that anyone could use. That assumption is congruent with evidence regarding a variety of extremist groups that have perpetrated suicide attacks in order to attain different goals. Terrorism as a tool view is also coherent with a typical psychosocial conception about behaviour and social interaction. Are suicide campaigns entirely rational? A suicide attack is an offensive operation whose execution depends upon the death of the perpetrator. This behaviour involves some degree of rationality. According to the most influential theoretical model in contemporary social sciences, individuals, organisations and social movements usually behave like rational actors (Coleman, 1990; Rosenberg, 1995). A rational actor use to behave in the way he believe is in his best interest. In other words, rational actors only choose those options of behaviour that they considered the most effective means to attain his goals or satisfy his preferences. In other words, rationality is related to instrumental or goal-oriented actions, which is coherent with the terrorism as a tool view. The notion of instrumental orientation of suicide behaviour is supported by two main reasons. First, the fact that most of suicide attacks do not constitute isolated incidents but are grouped in campaigns, according to a precise schedule and guidelines. Second, the groups and leaders that promote suicide attacks select this method among others in order to achieve certain strategic goals. The arguments that jihadi leaders and ideologues employ to justify suicide bombings and the analysis of the evolution of most terrorist organizations that have conducted suicide attacks campaigns makes evident the instrumental meaning of such violent activity (Pape, 2005). Volunteers may not be willing to blow themselves fully aware of it but their deaths usually serve a plan designed to attain certain strategic, operational and tactical goals. The main strategic goals associated with suicide are the expulsion of foreign occupying forces, national independence, destabilization or replacement of a political regime, intensification of a violent conflict in progress, or interruption of some process of peaceful solutions for a political, ethnic or religious conflict (Ganor, 2001; Bloom, 2005; Pape, 2005; Gupta & Mundra, 2005; Moghadam, 2007). Moreover, there are several tactical and operative advantages. The most important are the following: higher lethality, intense psychological and social impact, attract wide media coverage, communication of relevant messages to target audiences (determination, commitment to escalate, deterrence of neutral observers, shaming the enemy, solicitation of recruits (Hafez, 2007)), access to well-protected and high value targets, independence from remote controls systems to activate explosive devices, no required escape plan, no chance to capture the attackers, etc. (Ganor, 2001; Bloom, 2005; Pape, 2005; Moghadam, 2007; Hafez, 2007). Considering all these advantages and so far rationality involves instrumental motivation and a calculus of the benefits and costs of an action, “it is evident that committing a suicide attack is an outcome of a rational decision” (Ganor, 2001). But, is it completely rational? Although most researchers would agree that suicide terrorist campaigns follow an instrumental logic at the strategic level, there are several reasons to assert that pure rationality cannot give a complete explanation of the phenomenon. There is a wide variety of motives that seem connected to suicide terrorism beyond rational considerations. It is important to underline the influence of not 'outcome-oriented' motivations that have encouraged people to become a suicide bomber or support suicide terrorism (Kruglanski et al., 2009). Thus, emotions related to pain and personal loss, humiliation, hate or vengeance can play a decisive motivational role (Bloom, 2005; Ricolfi, 2005). But norms can also be crucial. For instance, based on information extracted from interviews, Atran (2006) has suggested that deep sense of obligation to become “martyrs” proves the prevalence of non-instrumental motivations among religious oriented suicide bombers. Another argument against the view of suicide terrorism as entirely rational could be deducted from the own limitations of the rational choice theory. In its earlier version, rational choice theory assumed that human rationality tends to be almost perfect. However, psychological research has shown that the rationality of human beliefs and choices is bounded and imperfect because of the own cognitive limitations of the human mind and its interferences with emotion and motivation (Simon, 1995; Kahneman, 2011). A psychosocial approach to explaining any terrorist behaviour has to bear in mind the principle of bounded rationality. This approach is coherent with the following consideration from Elster (2006): “In itself, there is nothing irrational in the willingness to sacrifice one´s life for a cause, an even less in the willingness to send others to their death for it…nevertheless in some case suicide attacks fall short of being fully rational due to the instability of the underlying motivations or also because some attackers are subject to irrational belief formation”. Social psychological perspective tends to explain the psychological characteristics of individuals as a result of processes of social interaction. Since there is not a unique typical profile the previous psychosocial assumption could be useful for tracing the origin of the willingness to perpetrate a suicide attack. The pathway towards the participation in a suicide mission can be analyzed as the result of an accumulation of socialization processes that can be accounted for by classic social psychological mechanisms. This is congruent with the empirical evidence about how the process of joining a terrorist group usually is heavily influenced by the prevailing political and social environment shared by friends and relatives. Several studies conclude that becoming a terrorist is basically an issue of socialization (Fields, 1979; Silke, 2006). Radicalization and engagement in violent activities are facilitated by contacts and links with people who already have embraced an extremist ideology. Social interaction is the vehicle through which individuals receive the “reasons” that motivate and “justify” their desire to give up their lives to carry out a terrorist attack. As a condition of integration in a terrorist group, social interaction also makes possible that people who choose to participate in a suicide mission put this willingness into practice. The interaction between the would-be suicide bombers and members of radical networks or extremist organizations could follow two patterns of social influence. The first is a bottom-up pattern in which the would-be suicide attackers take the initiative of joining a radical network or terrorist organization. The studies conducted by Sageman (2004, 2008) have shown the importance of this pattern for the engagement of people in the so called global salafi jihad movement. Sageman (2004) has stated that joining this violent movement that supports and promotes suicide terrorist attacks is, in essential, a bottom-up activity. On one side, Al Qaeda, because it is a more prominent organization, doesn’t have top-down formal recruitment program. On the other side because the reaction to 9/11 attacks provoked the operational dead of Al Qaeda and, as a result, the groups that continued perpetrating suicide attacks in the name of Al Qaeda were not formally subordinated to Al Qaeda top leadership, but a bunch of friends who get together and after been inspired by Al Qaeda´s discourse decided to do something (Sageman, 2004; 2008). Although the Sageman point of view has been strongly criticized by other experts, we should retain his emphasis on how pre-existing social bonds (kinship, friendship and later informal cliques) facilitate the radicalization of individuals and groups who meet in their neighborhoods and on the Internet and plot violent actions, including suicide attacks. The second pattern of influence through social interaction that contributes the making of suicide bombers is a top down or vertical one. This pattern involves initiatives promoted by leaders and members of terrorist organizations in contacting and relating to the would-be suicide attackers, as well as recruiting, indoctrinating and training them. So far suicide attacks are rarely perpetrated by individuals acting on their own, but by people who become members or organizations, groups, or cells attached to a larger network, this type of influence processes should not be underestimated for understanding suicide terrorism. As Hafez (2007) claims, terrorist groups and organizations play the role of mobilization structures that facilitate the engagement of new volunteers for sacrificing their lives on behalf of a political or religious cause. On the other hand, some studies have detected significant similarities between the indoctrination methods applied by sectarian groups and those that are used inside terrorist organisations (Della Porta, 1995; Sageman, 2004; De la Corte, 2006). In any case, there is no doubt that the activities and lifestyle adopted within terrorist organisations shape the mentality of its members, intensifying their commitment to such organisations and preparing them to participate in violent activities as suicide attacks. Typical organizational practices in which would-be suicide bombers are stimulated to participate, like binding or religious rituals, making written or videotaped statements a few days before the mission, and their integration in tightly knit units seem designed to sustain the ephemeral state of mind required to detonate themselves (Merari, 1990; Gambetta, 2006). William James (1891) stated in his pioneering book Principles of Psychology that the way that people define themselves is central for explaining their mental states, their feelings, and their behaviours. Social psychology and other social sciences recovered that principle focusing on the social aspects of identity, that is, the attributes of the self-concept that individuals share with other people, allows to define themselves as members of a social group or community. The study of social identity (or collective identity, as many sociologists and political scientists prefer to say) have opened a window to understanding how psychological processes interact with social and political processes in the causation of human social behavior and collective action. Consequently, it is not rare that many social scientists consider social identity a particularly relevant phenomenon for study terrorism (Taylor and Louis, 2003; De la Corte, 2006). Actually, the mechanisms and experiences of collective identification play a central role in the emergence, activity and evolution of every type of political or religious movement or organization, including extremists and terrorist cases. Moreover, this appears to be particularly clear in the case of suicide terrorism, no matter if we focus on meanings that human bombers give to their actions or the support that terrorist attacks could receive in some societies. Research on radicalization indicates that involvement in suicide terrorism often begins with individual’s need to find or restructure a meaningful identity (Dalgaard-Nielsena, 2010; Mursheda & Pavan, 2011). Membership of supportive social groups can reduce uncertainty and enhance an individual’s self-esteem, thus treating some of the wounds caused by difficult personal experiences. Particularly, terrorist organizations offer an ideology with a strong moral component, profound meaning, and an optimistic vision of the future. It is not a coincidence that suicide terrorist organizations tend to describe themselves as the champions of their own national, ethnic or religious groups, volunteers for suicide missions consider their death as a sacrifice for the sake of their own community, and terrorist propaganda try to promote this idea among their own reference community. So it is also normal that nationalist and religious motivations, feelings and arguments appear connected to suicide terrorism. Pape (2005) has stated that nationalism is the “taproot” of modern suicide terrorism. This author defines nationalism as “the belief among members of a community that they share a distinct set of ethnic, linguistic, and historical characteristics and are entitled to govern their national homeland without interference from foreigners”. In part, Pape (2005) also attributes certain influence to religion on suicide campaigns when it appears attached to nationalism, which is supported by his own analysis of the universe of cases in which a democratic state controlled the homeland of a distinct national community for the period 1980 to 2003. Thus, 49 of 58 cases were congruent with a nationalist theory of suicide terrorism which predicts the occurrence of suicide campaigns as a result of a combination of two factors: the existence of a violent organized resistance (“rebellion”) and the existence of a religious difference between the foreign occupier and the local community. According to Pape (2005), those factors are crucial because suicide terrorism campaigns require significant community support and foreign occupation and religious differences favour the identification of a local community with a local terrorist organization. Anyway, it is true, as Pape (2005) also states, that martyrdom (death for the sake of one´s community) is a social construct and it is the reference community of the terrorist that judges whether the self-sacrifice of specific individuals meets the requirements for the special status of martyr. However, other authors consider that Pape’s nationalist theory of suicide terrorism underestimates the influence of religious identity on the perspective, motivation and behaviour of suicide organizations and their volunteers and supporters. This seems true if we observe the evolution of suicide terrorism during the last years, a period in which global jihadism has become the main inspiration for suicide attackers all over the world. Since, during the 1980s and 1990s, the vast majority of attacks took place in only a handful of countries like Israel, Lebanon, Sri Lanka, and Turkey, the emergence of the threat represented by Al Qaeda showed that suicide terrorism also could be a method used by religious but non-nationalistic terrorist organizations. Next, when suicide attacks perpetrated by jihadist networks, groups and organizations in Iraq and other Muslim countries increasingly targeted Muslim people it became clear that suicide campaigns could be adopted as part of a strategy not only to gain a national homeland, but also to depose political regimes (in those cases, regimes regarded as un-Islamic, according to the jihadist view; see, Moghadham, 2007). Moreover, the experience of suicide terrorism in Iraq since 2003 exemplify perfectly that nationalism is not the main driver of suicide terrorism, considering that it corresponds to an Arab occupied country with the highest rate of suicide attacks for several years most perpetrated not by Iraqis suicide volunteers but foreign religious fanatics from Jihadi Salafi networks, and not against foreign forces but directed at Iraqi security forces and local population (Hafez, 2007). Depersonalization: the terrorists tend to perceive themselves as interchangeable members of their own group or organization. As a result of that, they could give preference to the interests and goals of the organization against their personal needs and goals, which is a requisite for involving in suicide operations. Social cohesion: the identity share by terrorists promotes positive relationships among them, increasing intragroup cohesion and cooperation, which facilitate the preparation and execution of suicide missions. No less important, social psychological research has shown that excessive group cohesiveness leads to group polarization effects, that is, a propensity for groups to develop attitudes and make decisions that are more extreme than the mean of individual members’ initial positions (Gill, 2007). In-group influence effects: the more intense become the identification from a terrorist with their group, the greater influence the group would exert on him. The group influence effects provoked by group identification are several: obedience to the order of group leaders, majority influence (yield the majority opinion), normative influence (private and public agreement with the normative structure of the group and the norms which rule their member´s behavior). Manichean worldview and intergroup bias: identification with their group and reference community motivates terrorist to develop negative stereotypes and prejudices about people from other communities. The world is divided between us and them. The responsibility of problems and injustices suffered by the terrorist’s reference community may be attributed to another community who could play a scapegoat role. This perspective tends to reinforce the agonistic worldview and negative emotions (humiliation, resentment, hate) that usually inspire terrorists. At the first sight, only one thing could be needed for a suicide terrorist attack to happen: the existence of an individual willing and capable to die to kill others. However, the majority of terrorist suicide attacks are perpetrated by militants of any more or less organized group. Finally, as Lankford (2010; 2011) put it, social approval of any activity increases the likelihood that people will engage in it, and suicide terrorism is no exception. Indeed, we have seen before that it is difficult to explain the prevalence of the majority of suicide campaigns without taking into account the support that these activities received from certain communities or audiences. So, generally speaking, the explanation of suicide terrorism raises different questions that correspond to three level of analysis: why and how organizations promote suicide attacks (organizational level), why and how individuals agree to become human bombs (individual level), and why suicide terrorism received support from certain audiences (societal level) (Pape, 2005; Moghadam, 2007). It is not possible to develop a complete understanding of suicide terrorism without investigating the phenomenon on those three levels. As we mentioned before, contrary to other psychological perspectives, social psychological approaches focus not on the individual and their presumed psychological qualities, but on process variables such as the changing context that the individual operates in, and also the relationships between events and the individual as they affect behaviour. Taylor and Horgan (2006) have argued that adopting that view may lead to better conceptual development in analyses of terrorist behaviour. It should be noted that the emergence of suicide terrorist campaigns tend to occur at a final point in the escalation processes in which terrorist organizations attack evolves towards greater levels of destructiveness (Bloom, 2005). Most terrorist organizations use other modalities of attacks before they begin to perpetrate suicide missions (Moghadam, 2007). It suggests that suicide terrorism involves a specific dynamic. Inspired by Pedahzur (2004), we can assume the emergence of a suicide campaign needs to cover two phases. The initial phase would be the result of what we could name a strategic or tactic shift. During this phase calculations and strategic and tactical discussions are made inside a terrorist organization provoking the decision to engage in suicide attacks. The second stage involves more or less simultaneous activation of two psychosocial processes needed to start and continue a suicide campaign. The first would be a radicalization process by which a number of individuals begin to sympathize with the aims and political or religious ideology of the insurgents, motivating to integrate in a would-be suicide terrorist organization and become volunteers to carry out suicide operations. Nevertheless, many authors agree that the movement from radicalization to action for the sake of a collective cause usually needs the intervention of some selective incentives. One more time, we should remember that probably the most influential selective incentive to become a suicide bomber is the belief that he will be celebrated as a martyr. Nevertheless, this only can arise as a result of the political or religious polarization, that is, a process by which the political or religious attitudes of a given community or audience going to extremes in a direction of supporting suicide terrorist activities. Based on previous accumulated research about our topic, the last part of this chapter will identify several variables which could contribute to activate and accelerate the three aforementioned processes involved in the dynamics of suicide terrorism. Since any of these variables guarantee by itself the emergence or prolongation of a suicide terrorist campaign, we proposed interpreting them as risk factors, that is, as single conditions which can increase the likelihood that a terrorist network, group or organization resort to suicide violence or prolong a suicide terrorist campaign (De la Corte and Giménez-Salinas, 2009). Asymmetric conflicts. Suicide missions are often carried out by the weaker side in conflicts characterized by a patent asymmetry in terms of military force (Atran, 2006; Pape, 2005; Merari, 2005; Gambetta, 2006). Therefore, a real or perceived great imbalance of power between the terrorists and their adversaries could intensify the motivations to incorporate suicide methods into their repertory of action. Feeling of stagnation, crisis or methodological failure. Sometimes, the leadership or some factions of a terrorist organization can get the impression that they are arriving at a point of stagnation or crisis, as a consequence of the ineffectiveness of strategies, tactics and methods previously employed (Pape, 2005). This impression can lead terrorists to consider suicide operations as an alternative method which could help to overcome the perceived state of stagnation, crisis or failure. Competition among terrorist or insurgent groups. Suicide operations attract more attention than any other terrorist method; the organizations that promote them send a message of determination, and the suicide bombers appear the most dare and heroic. These qualities could become powerful incentives to deploy suicide attacks if several terrorist organizations operate in the same territory, pursuing equivalent goals and trying to capture the attention and gain the support of the same community or audience. According to Bloom (2005), different historical examples confirm that suicide tactics can emerge where multiple organizations with increasing degrees of lethality try to distinguish themselves from their competitors. In fact, the shift toward suicide violence can intensify the escalation, especially in environments where domestic communities begin to support suicide bombings, encouraging the non suicide organizations to adopt the same tactic. Cognitive accessibility and pre-existence of a suicidal terrorist activity A first condition to make the decision of employing suicide operations is to know and think about them (Kalyvas and Sánchez Cuenca, 2006; Elster, 2006). In part for this reason the exposure to examples or information about suicide mission perpetrated by one or more organizations sometimes can further inspire other groups to emulate the former. This can occur in a single environment marked by competition among different terrorist organizations, but also it can provoke the diffusion on suicidal tactics from one context to other. However, insofar suicide terrorism would be the consequence of a strategic or tactic shift, the contagion effect only will take place under a particular condition, i.e. the exposure to examples (models) or information about suicide attacks to attribute suicide attacks a major tactic effectiveness in comparison to conventional terrorism. This is consistent with a central postulate from the Social Learning Theory which states that people usually need having a good reason to imitate others and that reason usually results from the association of some (observed or presumed) reward to the behavior that could be imitate (Bandura, 1979). Bandura adds that the more similarities (attitudes, traits, or values) an observer attribute to other people, the more likable will be that the former imitate the successful behavior of the latter. On the other hand, social movement theories postulate that the transference of new strategies and tactics also can be facilitated by situational similarities. In this sense, Della Porta and Diani (2006) pointed out that perceptions of common circumstances enable activists to adopt methods from different countries or regions because they see a “functional equivalence” between the transmitters and adopters of innovation. At the same time, Hafez (2007) puts that the exposure to examples of suicide attacks executed by others not only favors the diffusion of suicide tactic because it appears successful, but also seems legitimate in the eyes of potential imitators. Intractable conflicts. Intractable conflicts are protracted, irreconcilable, violent, of a zero-sum nature, total, and central, with the parties involved having an interest in their continuation, and seemingly irresolvable (Kriesberg, 1998). It is interesting to consider the psychological consequences of intractable conflicts. Since intractable conflicts are painful, stressful, exhausting, disturbing, and costly both in human and material terms, society members or human groups involved tend to develop a set of share attitudes and cognitions that provide a dominant orientation and ethos that enable them to cope successfully with the conflict situation (see Bar-Tal, 2000, 2007). In attitudinal terms this “psychological infrastructure” can include elements as devotion to the own country, ethnic or religious community, high motivation to contribute, persistence, readiness for personal sacrifice, unity, solidarity, determination, courage, and maintenance of the society’s or community objectives. These attitudes normally are complemented by a core of central shared beliefs. Among the several shared beliefs suggested as elements of this conflictive ethos we would emphasize the following: beliefs about justness of one’s own goals that lead to conflict, beliefs of positive self-image concerning the ethnocentric tendency to attribute positive traits, values, and behavior to one’s own society or community, beliefs of one’s own victimization concerning self-presentation as a victim, focusing on the unjust harm, evil deeds, and atrocities perpetrated by the adversary, beliefs of delegitimizing the opponent, beliefs of patriotism and unity which generate attachment to their own country or community by propagating loyalty, love, care, and sacrifice and refers to the importance of ignoring internal conflicts and disagreements in order to unite the forces in the face of external threat (Bar-Tal, 2007). Needless to explain how the conflictive ethos resulting from this shared beliefs and their corresponding attitudes can create a propitious environment to engage in extreme practices like suicide bombing for the sake of their own community or to support them. Apart from creating a particular conflictive ethos, sustained or intractable conflicts impact upon the states of mind of individuals and collectives in other forms that also can facilitate radicalization process and increase the support to violence, including suicide violence. Particularly, we will focus on two effects: mortality salience and personal or proximal trauma. Mortality salience. Sustained conflict brings a sense of threat to the fore. An increased awareness of one's eventual death –mortality salience- becomes an important element of that intense sense of threat. Psychosocial research has shown that mortality salience and fear of death stimulate an array of relevant psychological consequences that can contribute to involve in suicide violence and support suicide terrorist organizations. First, when a sense of threat or their own death becomes salient positive feelings towards one’s belief system and those holding similar beliefs arouse. As a result of that, it is highly likely that people bolster their own worldview, engaging in a so called “worldview defense”, while they also increase connections with one's in-group and negative feelings towards those perceived to be a threat. Besides, Greenberg et al. (1990) have showed a significant link between the fear of death and what Kruglansky & Fishman (2009) identify as the “deep theme” that underlies most of numerous surface differences terrorists’ motivation: the quest for personal meaning and significance. Put in the words of the authors, generally the awareness of the own mortality and the fear of living a life that is insignificant motivates people to be “good” members of society. But when the group faces a severe perceived threat to its existence the ultimate “goodness” would be sacrificing one’s self for the sake of the larger group. Moreover, besides the group first is highly valued, it could bring the promise of immortality by becoming a martyr engraved forever in the group’s collective memory (Kruglansky & Fishman, 2009). Mortality salience also increases reliance on stereotypes to characterize the threatening out-group (Schimel et al. 1999, Arndt et al. 2002). Studies also have found a positive correlation between threat salience, the likelihood of resorting to authoritarian modes of thinking (Greenberg et al., 1990; Lavine et al., 2002; Gill, 2007) and the need for strong leaders to lessen the anxiety produced by the situation (Montuori 2005), including leaders who espouse authoritarian values and symbolic narratives perceived to be legitimate and aggressive toward those who cause the threat and anxiety. Gill (2007) has emphasized the relevance of the aforementioned experimental data to understand the process whereby audiences become susceptible to the influence of narratives and leaders that promote suicide terrorism. Trauma. Some traumatic events frequently operate as death reminders, helping to activate the effects linked to mortality salience. Apart from that, relationship between frustrating or traumatic experiences and aggressive behaviour is a classical topic for social psychologists. This idea, which is consistent with commonsense has been proposed by several writers to explain the origins of volunteerism for suicide attacks (Speckhard & Akhmedova, 2005). Given that many suicide bombers haven´t been personally traumatized, not to mention that most of traumatized people do not involve in terrorism and vast majority of terrorists don’t suffer from mental disorders, we can’t support the trauma theory as a general explanation. However, if we review the list of catalysts that usually precipitate the compulsion to become a suicide bomber we can see that several involve some kind of traumatic incident like personal suffering, experiencing of humiliation, exposure to acts of violence by opposition forces, torture or death of some friend or family member (see below), imprisonment, restrictions on movement, frustration of personal goals, etc. (Gill, 2007). It should be noted that, some of these traumatic experiences can be relatively frequent among individuals who belong to a discriminated minority or people who live in societies undergoing violent conflicts. Aggressive counterterrorist measures. Correlation between overreactions to terrorism and the increase of terrorist activity has been noted on several occasions. Percentages of support for suicide attacks are higher in countries or regions where potential sympathizers and reference community of terrorist groups have suffered severe repression perpetrated by security or foreign forces. Palestine, Chechnya and Sri Lanka provide empirical regularity about suicide bombers who lost a family member to the “unjust state” and resolve to participate in suicide missions to express their outrage (Bloom 2005; Ricolfi, 2005). In addition, suicide organizations can try to recruit people who have lost relatives as a consequence of counterterrorism. Nevertheless, although there are examples of counterproductive effects of hard counterterrorism operations in terms of increase in suicide terrorism, we also can find cases where suicide campaigns have been developed during a period of a decrease of hard counterinsurgent operations (Pape, 2005). Wide contrast in terms of Identity. According to a well known principle on social psychology the larger differences aggressors attribute to their victims, the greater levels of violence would be used. As it was previously suggested in other terms, the people who identify suicide organizations and their militants as members of their own group or community are more disposed to support them than others. Actually, the support can be higher when the terrorist’s reference community perceive clear differences between them and the targets of the attacks. Although Pape’s study apparently confirms that such contrast can be mainly or exclusively based on nationality or religion, other differences matter too, e.g. differences on political attitudes or even profession (remember that suicide attacks against military personnel or senior officials usually get a stronger social support than those attacks carried out against civilians). Anyway, none of those characteristics are necessary conditions for involvement in suicide terrorism or support it. Indeed, often the most influential unique differences that separate the identity of terrorists from their victims depend on stereotypes and biased beliefs rather than on nationality, religion or profession. These stereotypes and beliefs, which constitute essential elements of the ideology, discourses and propaganda of suicide terrorist organizations, shape an image of the targets of terrorist attacks as enemies, frequently characterized with subhuman or demoniac attributes (Bandura, 1998). Stigmatization, dehumanization and demonization discursive and propaganda strategies are employed in order to exclude the victims from the ordinary sphere of morality. As Opotow (1990) explained, people who are morally excluded are perceived as nonentities, expendable, or undeserving; consequently, harming or killing them appears acceptable, appropriate, or even just. Indeed, along with the spread of a culture of martyrdom (see below), the derogation of the victims can further suicide terrorism through a redefinition of that practice as morally acceptable actions. Culture of martyrdom. The diffusion of a culture that frames the death of human bombers as an altruistic and venerable action for the sake of their own community (that is the meaning of martyrdom operations) is probably the most important accelerant of radicalization, mobilization and polarization that stimulate suicide terrorism. First, this requires the selection and exploitation of texts, traditions, myths, symbols, and rituals extracted from the culture or the religion that suicide promoters share with their constituency of supporters, no matter if it is local community or a transnational distributed constituency connected via internet. That selection of arguments and symbols enables to create the contents of a cultural or martyrdom: basically, an agonistic narrative and rhetoric that heightens the sense of threat among the members of their own constituency and imbue suicide attacks with morality, besides demonizing the targets of suicide attacks. The culture of martyrdom that promotes jihadist leaders and organizations adds a significant religious appeal for suicide terrorism through linking “martyrdom operations” to some heavenly rewards as the atoning for previous sins or to attaining paradise. After creating its own culture of martyrdom, terrorist organization tries to spread it, resorting to an array of means: preaching, propaganda, discourses of charismatic leaders and epistemic authorities, agency-laden institutions, indoctrination etc. Finally, the adoption and diffusion of a culture of martyrdom has the main effect of creating a state of moral disengagement (Bandura, 1998), that is the suspension of ordinary ethical standards that usually refrain people from commiting or supporting murder and suicide (Hafez, 2007). In some critical aspects, suicide terrorism is not so different from other social behaviours. Suicide attacks and campaigns share with others social behaviour the same goal of influence people to change their (political) attitudes and behaviours. Similarly to others social phenomenon, suicide terrorism results from a combination of instrumental and non-instrumental motivations, including strategic, operational and tactical goals as much as emotions and social or cultural norms. Social interaction and social identification processes are the bridges trough which some individuals and militants become volunteers for suicide operations. Finally, as many other social phenomenon suicide terrorism involves the concurrence of organizational, societal and individual causes and facilitators. By understanding those factors policymakers and security officials should be able to better predict when a terrorist threat could evolve to suicide violence expressions. 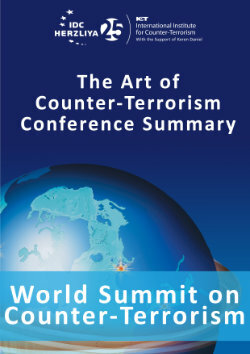 In addition, this knowledge should guide the implementation of short and long term countermeasures. Arndt, J., Greenberg, J., & Cook, A. (2002). Mortality Salience and the Spreading Activation of Worldview-relevant Constructs: Exploring the Cognitive Architecture of Terror Management. Journal of Experimental Psychology 13(3), 307–324. Aronson, E. (1999). The Social Animal. New York: Worth Publishers. Atran, S. (2006). The moral logic and growth of suicide terrorism. The Washington Quarterly, 29(2), 127-147. Bandura, A. (1979). The social learning perspective: Mechanisms of aggression. In H. Toch (Ed. ), Psychology of crime and criminal justice (pp. 193-236). Prospect Heights, IL: Waveland Press. Bar-tal, D. (2000). Shared Beliefs in a Society: Social Psychological Analysis. Thousand Oaks: Age. Bar-tal, D. (2007). Sociopsychological Foundations of Intractable Conflicts. American Behavioral Scientist 50(11), 1430-1453. Bloom, M. (2005). Dying to kill. The allure of suicide terror. New York: Columbia University Press. Castells, M. (2004). La era de la información (vol. II): el poder de la identidad. Madrid: Alianza. Coleman, J. S. (1990). Foundations of Social Theory. Cambridge: Harvard University Press. Dalgaard-Nielsena, D. (2010). Violent Radicalization in Europe: What We Know and What We Do Not Know. Studies in Conflict & Terrorism 33(9), 797-814. Della Porta, D. (1995). Social Movements, Political Violence, and the State: A Comparative Analysis of Italy and Germany. New York: Cambridge University Press. Della Porta, D., & Diani, D. (2006). Social Movements: an introduction. Oxford, Blackwell. De La Corte, L. (2006). La lógica del terrorismo. Madrid: Alianza. De La Corte, L., Kruglanski, A; De Miguel, J.M; Sabucedo, J.M., & Díaz, D. (2007). Seven Psychosocial Principles for Explaining Terrorism. Psychology in Spain, 2008, 12(1), 70-80 . De La Corte, L., & Giménez-Salinas, A. (2009). Suicide Terrorism as a Tool of Insurgency Campaigns: Functions, Risk Factors, and Countermeasures. Perspectives on Terrorism, 3(1), 11-19. Elster, J. (2006). Motivations and beliefs in suicide missions. In D. Gambetta (Ed. ), Making sense of suicide missions (pp. 233-258). Oxford: Oxford University Press. Fields, R. (1979). Child Terror Victims and Adult Terrorists. Journal of Psychohistory, 7 (1), 71–76. Gambetta, D. (2006). Making sense of suicide missions. Oxford: Oxford University Press. Ganor, B. (2001). The Rationality of the Islamic Radical Suicide attack phenomenon. In B. Ganor (Ed. ), Suicide terrorism: An overview. Herzliya: Institute for Counterterrorism. Gill, P. (2007). A multidimensional approach to suicide bombing. International Journal of Conflict and Violence 1(2), 142-159. Greenberg, J., Pyszczynski, T., Solomon, S., Rosenblatt, A., Veeded, M. Y., & Kirklan, S. (1990). Evidence of terror management theory II: the effects of mortality salience reactions to those who threaten or bolster the cultural worldview. Journal of Personality and Social Psychology, 58(2), 308-318. Gupta, D. K., & Mundra, K. (2005). Suicide bombing as a strategic weapon. An empirical investigation of Hamas and Islamic Jihad. Terrorism and Political Violence 5(17) 573-598. Hafez, M. (2007). Martyrdom mythology in Iraq: how jihadists frame suicide terrorism in videos and biographies. Terrorism and Political Violence, 19(1), 95-115. James, W. (1891). The principles of psychology. London: Macmillan. Kahneman, D. (2011). Thinking fast and slow. New York: Farrer, Straus & Giraux. Kalivas, S., & Sánchez Cuenca, I. (2006). Killing without dying: the Absence of suicide missions. In D. Gambetta (Ed. ), Making sense of suicide missions (pp. 209-233). Oxford: Oxford University Press. Kriesberg, L. (1998). Intractable conflicts. In E. Weiner (Ed. ), The handbook of interethnic coexistence (pp. 332-342). New York: Continuum. Krueger, A. B., & Maleckova, J. (2002). Does poverty cause terrorism? The New Republic, 226(24), 27–33. Kruglanski, A. W., Chen, X., Dechesne, M., Fishman, S., & Orehek, E. (2009). Fully committed: Suicide bombers’ motivation and the quest for personal significance. Political Psychology 30(3), 331–357. Lankford, A. (2010). Suicide Terrorism as a Socially Approved Form of Suicide. Crisis: The Journal of Crisis Intervention and Suicide Prevention, 31(6), 287–289. Lankford, A. (2011). Requirements and Facilitators for Suicide Terrorism: an Explanatory Framework for Prediction and Prevention. Pespectives on Terrorism 5 (5-6), 70-80. Lavine, H., Milton, Polichak,, J., & Taber, C. (2002). Explicating the Black Box through Experimentation: Studies of Authoritarianism and Threat. Political Analysis 10(4), 343–361. Merari, A. (1990). The Readiness to Kill and Die: Suicidal Terrorism in the Middle East. In Origins of Terrorism: Psychologies, Ideologies, Theologies and States of Mind, W. Reich (Ed. ), 192–207. Cambridge: Cambridge University Press. Moghadam, A. (2007). Suicide terrorism, occupation and the globalization of martyrdom: a critique of Dying to Win. Studies in Conflict and Terrorism, 29(8) 707-729. Montuori, A. (2005). How to Make Enemies and Influence People: Anatomy of the Anti-pluralist. Totalitarian Mindset. Futures 37(10), 18–38. Mursheda, S.M., & Pavan, S. (2011). Identity and Islamic Radicalization in Western Europe. Civil Wars, 13(3), 259-279. Opotow, S. (1990). Moral exclusion and injustice: An overview. Journal of Social Issues, 46(1), 1-20. Pape, R. A. (2005). Dying to Win: The Strategic Logic of Suicide Terrorism. New York: Random House. Pedahzur, A. (2004). Toward an analytical model of suicide terrorism. A comment. Terrorism and Political Violence,16(4), 841-844. Pedahzur, A. (2004). Toward an analytical model of suicide terrorism. A comment. Terrorism and Political Violence, 16(4), 841-844. Rosenberg, S.W. (1995). Against neoclassical politicaleconomy: a political psychological critique. Political Psychology, 16(1), 99-136. Ricolfi, L. (2005). Palestinians: 1981-2003. In D. Gambetta (Ed. ), Making sense of suicide missions (pp.77-130). Oxford: Oxford University Press. Sageman, M. (2004). Understanding terrorist networks. Pennsylvania: University of Pennsylvania Press. Sageman, M. (2008). Leaderless Jihad. Terror Networks in the Twenty-First Century. Pennsylvania: University of Pennsylvania Press. Schimel, J., Simon, L., Greenberg., J., Pyszczynski, T., Solomon, S., Waxmonsky, J., & Arndt, J. (1999). Stereotypes and Terror Management: Evidence That Mortality Salience Enhances Stereotypic Thinking and Preferences. Journal of Personality and Social Psychology, 77(5), 905–926. Silke, A. (2006). The role of suicide in politics, conflict and terrorism. Terrorism and Political Violence, 18(1), 35-46. Simon, H. A. (1995). Rationality and political behavior. Political Psychology, 16(1), 45-61. Simon, B., & Klandermans, B. (2001). Politicized collective identity: A social psychological analysis. American Psychologist, 56(4), 319-331. Speckhard, A., & Akhmedova, K. (2005). Talking to terrorists. Journal of Psychohistory, 33(2), 125–156. Tajfel, H., & Turner, J. C. (1986). The social identity theory of intergroup behavior. In S. Worchel & W. G. Austin (Eds. ), Psychology of intergroup relations (pp. 7-24). Chicago: Nelson-Hall. Taylor, M., & Horgan, J. (2006). A conceptual framework for addressing psychological process in the development of the terrorist. Terrorism and Political Violence, 18(4), 585-601. Taylor, D. M., & Louis, W. (2003). Terrorism and the quest for identity. In F.M. Moghaddam & A. J. Marsella (Eds. ), Understanding terrorism. Psychological roots, consequiences and interventions. Washington: American Psychological Association. Turner, J. C., Hogg, M. A., Oakes, P. J., Reicher, S. D., & Wetherell, M. S. (1987). Rediscovering the social group: A self-categorization theory. New York: Blackwell. To What Extent Do Global Terrorism And Organised Criminality Converge?